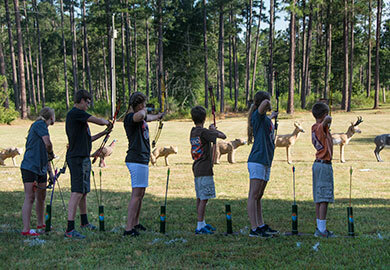 Youth archers line up at the range at Belfast Wildlife Management Area in Laurens County at the recent Fun Shoot. The event was part of the National Archery in Schools Program, a joint venture between the S.C. Department of Education and DNR. (DNR photo by Cindy Thompson). The S.C. Department of Natural Resources recently hosted a National Archery in Schools Program 3-D Fun Shoot at the new Belfast Wildlife Management Area archery range in Laurens County for more than 30 youth participants, most of whom were involved through their school archery programs. The event featured 3-D International Bowhunting Organization targets in the shapes of deer, bears, and other game animals for participants to practice their archery skills on. Participants were required to have attended a National Archery in Schools Program school in order to qualify for the event. South Carolina Department of Natural Resources (DNR) staff provided lunch, as well as arrows and loaner bows. The July 8 Fun Shoot was the first time the archery range at Belfast Wildlife Management Area (WMA) has been used by the public. The range is located next to the Belfast Plantation house. DNR Deputy Director Emily Cope led a historical tour of Belfast WMA during the event, encouraging the "Fun Shoot" participants to visit again and use local WMA lands – more than 1.1 million acres in the DNR’s WMA Program are open for public recreational activities such as hunting, fishing, wildlife viewing and nature study. Belfast WMA is a 4,600-acre area located between two sections of Sumter National Forest. It contains hardwood forest, pine forest and wetlands that are home to a variety of wildlife species. The area also houses a historic plantation home that dates back to 1786. Belfast WMA is open to the public for hunting and other recreational activities. DNR uses the plantation home for educational programs and group events. National Archery in Schools Program is a joint venture between the S.C. Department of Education and DNR. Several archery equipment manufactures and organizations are also partners. The program promotes student education, physical education and participation in the life-long sport of archery. The program's focus is to provide international style target archery training in physical education classes grades 4-12. The South Carolina program has however been modified in some schools to accommodate agricultural classes, in-school outdoors clubs and special education classes. For more information see the S.C. Department of Natural Resources' National Archery in Schools Program–affiliated youth archery program or visit the program's Facebook page.